You’ll perhaps recall from our past Tarka Dal adventures that I had an aversion to plunging straight into all-vegetarian curries dishes. I’ve been working on this. CB found this lovely recipe in Rick Stein’s India and it’s probably for the best that she didn’t tell me that we were going to eat it until it was too late or I may have rallied against it. Don’t make this mistake. The ingredients themselves are simple and almost all of them should be in your cupboard or readily available; including asafoetida which, due to the “Ottolenghi effect”, is now widely available in larger supermarkets. 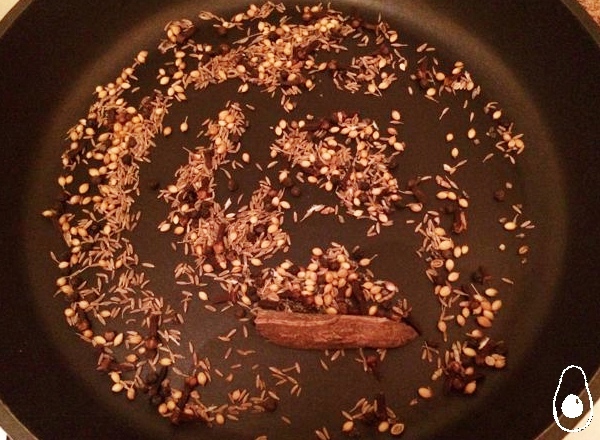 Make the garam masala yourself if you have the time and the inclination: you won’t regret it. The punchiness of freshly ground spices makes a real difference. This recipe is delicious, warming, hearty and healthy. The stew itself is gluten free and, if you use soya spread instead of butter, totally vegan. Serve with toasted naan breads or rice and a generous dollop of mango chutney. 300g whole urid – also known as small black bean or sabut urid. We found this at our local large supermarket and also in a unsuspecting corner shop on Finchley Road – do some exploring! Wash the beans in about 5 changes of water. Cover with fresh water so that the water line is 4cm above the surface of the lentils. Leave to soak overnight. When you’re ready to cook, add the beans and the water they soaked in to a pan with the chilli powder and 2 tsp of mustard oil. Bring to a gently simmer, cover and cook on low for 1.5-2 hours. 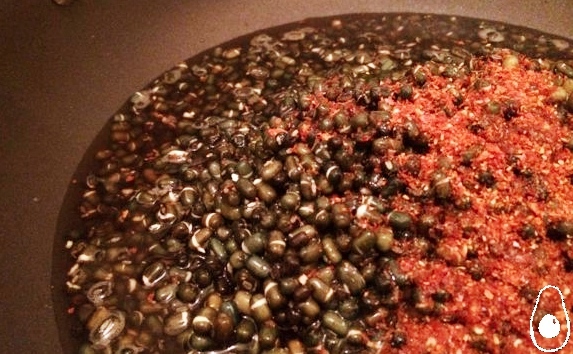 Keep an eye on it and top it up with a little water at a time if necessary until the lentils are totally tender. In the meantime, heat the remaining oil in a frying pan. Gently fry the cinnamon stick and bay leaves for a minute, then add the onions. Cook until golden, 10 minutes. Add the tomatoes, spices and salt and cook for another 10 minutes until slightly reduced. Add the tomato and lentil mixtures together and simmer for 15 minutes. At the very end, stir in the butter and turn off the heat. Stir through the coriander and ginger just before you serve. To Fiesta Friday and Tuesday’s Table!